The Economics of Immigration summarizes the best social science studying the actual impact of immigration, which is found to be at odds with popular fears. Greater flows of immigration have the potential to substantially increase world income and reduce extreme poverty. Existing evidence indicates that immigration slightly enhances the wealth of natives born in destination countries while doing little to harm the job prospects or reduce the wages of most of the native-born population. Similarly, although a matter of debate, most credible scholarly estimates of the net fiscal impact of current migration find only small positive or negative impacts. Importantly, current generations of immigrants do not appear to be assimilating more slowly than prior waves. Although the range of debate on the consequences of immigration is much narrower in scholarly circles than in the general public, that does not mean that all social scientists agree on what a desirable immigration policy embodies. 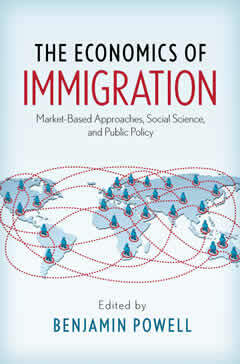 The second half of this book contains three chapters, each by a social scientist who is knowledgeable of the scholarship summarized in the first half of the book, which argue for very different policy immigration policies. One proposes to significantly cut current levels of immigration. Another suggests an auction market for immigration permits. The third proposes open borders. The final chapter surveys the policy opinions of other immigration experts and explores the factors that lead reasonable social scientists to disagree on matters of immigration policy. Click here to purchase from Amazon.com! The U.S. Government's accumulated national debt and unfunded liabilities in social security and Medicare could be pushing the country towards a fiscal crisis. How could such a crisis be avoided? If a crisis does strike, how might it be dealt with? What might be the long term ramifications of experiencing a crisis? 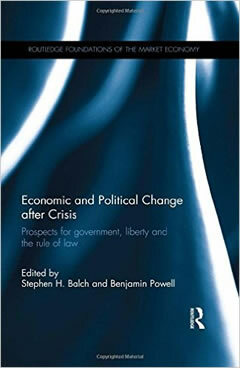 The contributors to Economic and Political Change After Crisis explore all of these questions and more. The book begins by exploring how past crises have permanently increased the size and scope of government and how well the rule of law has been maintained during these crises. 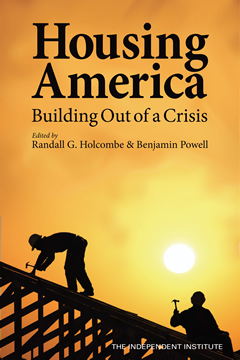 Chapters explore how these relationships might change in a future crisis and examine how the structure of the U.S. government contributes to a tendency towards fiscal imbalance. In a provocative contribution, the authors predict a U.S. government default on its debt. The book concludes by considering how a fiscal crisis might precipitate or interact with other forms of crises. Social scientists from a variety of disciplines, public policy makers, and concerned members of the general public would all benefit from the contributions contained in this book. If the U.S. is going to avoid a future crisis, or do as well as possible if a crisis occurs, the arguments in these chapters should be given serious consideration. This book provides a comprehensive defense of third-world sweatshops. It explains how these sweatshops provide the best available opportunity to workers and how they play an important role in the process of development that eventually leads to better wages and working conditions. Using economic theory, the author argues that much of what the anti-sweatshop movement has agitated for would actually harm the very workers they intend to help by creating less desirable alternatives and undermining the process of development. Nowhere does this book put “profits” or “economic efficiency” above people. Improving the welfare of poorer citizens of third world countries is the goal, and the book explores which methods best achieve that goal. 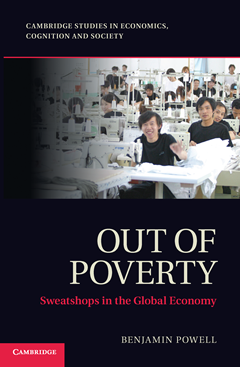 Sweatshops will help readers understand how activists and policy makers can help third world workers. Why do some nations become rich while others remain poor? Traditional mainstream economic growth theory has done little to answer this question—during most of the twentieth century the theory focused on models that assumed growth was a simple function of labor, capital, and technology. 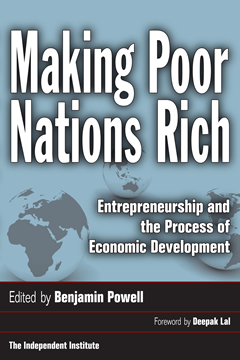 Through a collection of case studies from Asia and Africa to Latin America and Europe, Making Poor Nations Rich argues for examining the critical role entrepreneurs and the institutional environment of private property rights and economic freedom play in economic development. Making Poor Nations Rich begins by explaining how entrepreneurs create economic growth and why some institutional environments encourage more productive entrepreneurship than others. The volume then addresses countries and regions that have failed to develop because of barriers to entrepreneurship. Finally, the authors turn to countries that have developed by reforming their institutional environment to protect private property rights and grant greater levels of economic freedom. The overall lesson from this volume is clear: pro-market reforms are essential to promoting the productive entrepreneurship that leads to economic growth. In countries where this institutional environment is lacking, sustained economic development will remain illusive. Housing policy not only affects all Americans quality of life, but has a direct impact on their financial well being. About 70 percent of American households own their own homes, and for most, their homes represent the majority of their net worth. Renters are affected by housing policy. Even the small minority of Americans who are homeless are affected by housing policies specifically targeted to low-income individuals. The governments increasing involvement in housing markets, fed by popular demand that government "do something" to address real problems of mortgage defaults and loans, provides good reason to take a new look at the public sector in housing markets. Crises in prime mortgage lending may lower the cost of housing, but the poor and homeless cannot benefit because of increases in unemployment. Even the private market is heavily regulated. Government policies dictate whether people can build new housing on their land, what type of housing they can build, the terms allowed in rental contracts, and much more. This volume considers the effects of government housing policies and what can be done to make them work better. It shows that many problems are the result of government rules and regulations. Even in a time of foreclosures, the market can still do a crucial a job of allocating resources, just as it does in other markets. Consequently, the appropriate policy response may well be to significantly reduce, not increase, government presence in housing markets.